Background: Haematoxylum brasiletto is a tree that grows in Central America, commonly known as “Palo de Brasil,” which is used in the traditional medicine for the treatment of cancer and gastric ulcers. Objective: The aim of this study was to isolate the compounds responsible for antiproliferative activity of H. brasiletto. Materials and Methods: A bioassay-guided fractionation of ethanol extract of H. brasiletto was performed using 3-(4, 5-dimethylthiazol-2-yl)-2, 5-diphenyltetrazolium bromide cell proliferation assay to measure the antiproliferative activity on six human cancer cell lines (A549, LS180, HeLa, SiHa, MDA-MB-231, and NCI-H1299) and one human noncancer cell line (ARPE-19). The ethanol extract was partitioned with hexane, dichloromethane, and ethyl acetate. The active dichloromethane fraction was fractioned by silica-column chromatography, and active subfractions were separated using preparative-thin layer chromatography. The chemical structure of an isolated compound was elucidated with different chemical and spectroscopic methods. Results: The flavonoid brazilin (1) was isolated from the heartwood of H. brasiletto. The measurement of antiproliferative activity showed that brazilin can inhibit the growth of SiHa, MDA-MB-231, A549, and NCI-H1299 cell lines by 50% at doses of 44.3, 48.7, 45.4, and 48.7 μM, respectively. Furthermore, the flavonoid showed a high antiproliferative activity on LS 180 and HeLa with IC50 values of 62.2 and 71.9 μM, respectively. Brazilin also exhibited a high antiproliferative activity on the human noncancer cell line ARPE-19 with an IC50 value of 37.9 μM. Conclusions: Brazilin: (6aS,11bR)-7,11b-Dihidro-6H-indeno[2,1-c] cromeno-3,6a, 9,10-tetrol was isolated; this compound demonstrated antiproliferative activity against several human cancer cell lines. This work demonstrated that brazilin, a flavonoid isolated and characterized of H. brasiletto, has antiproliferative activity against cancer cell lines. Abbreviations used: MTT: [3-(4, 5-dimethylthiazol-2-yl)-2, 5-diphenyltetrazolium]; FBS: Fetal bovine serum; TLC: Thin layer chromatography. Brazilin demonstrated to have antiproliferative activity against human cancer cell lines and could be a potential source of anticancer agents. Cancer is a group of diseases that represent a serious public health problem. Cancer is the second highest cause of morbidity and mortality worldwide, with approximately 14.1 million new cases and 8.2 million cancer-related deaths. In addition, 32.6 million people are currently living with some kind of cancer. Thus, cancer is one of the main causes of death in developed countries. Some of the most common cancer types, such as breast, cervical, oral, and colorectal cancers have high cure rates when detected early and treated according to effective means, including surgery, radiation therapy, and chemotherapy. However, all these treatments are also accompanied of severe side effects such as tingling, burning, weakness or numbness in the hands, feet, or both, weak, sore, tired, or achy muscles, loss of balance, and shaking or trembling. Haematoxylum brasiletto H. Karst (Fabaceae), native from Mexico and extending into Central America, commonly known as “Palo de Brasil,” is used by rural communities in the State of Guerrero, Mexico, as traditional treatment for hypertension, stomach upsets, mouth infections, diarrhea, gastric ulcers, and cancer. An ethanolic extract of the stem bark of H. brasiletto was found to inhibit the growth of Escherichia coli O157:H7 (EHEC), verotoxin production, and adhesion of E. coli O157:H7 to HeLa cells.H. brasiletto has shown antimicrobial activities against Staphylococcus aureus 375, S. aureus ATCC 25923, and Enterococcus faecium 379. To provide scientific validation of traditional medicinal use of H. brasiletto for the treatment of cancer, in the present study, We evaluated the bioguided antiproliferative activity of H. brasiletto. All solvents used were of analytical grade. Methanol (PubChem CID: 887), ethanol (PubChem CID: 702), n-hexane (PubChem CID: 8058), dichloromethane (PubChem CID: 6344), ethyl acetate (PubChem CID: 8857), and sulfuric acid (PubChem CID 1118) were purchased from Fermont chemicals (Monterrey, NL, Mexico). CD3 OD was purchased from Cambridge Isotopes Laboratories, Inc., (Tewksbury, MA, USA). Water was purified by Milli-Q instrument (Millipore, Bedford, MA, USA). Dulbecco's Modified Eagle's Medium (DMEM) high-glucose, L-glutamine solution 200 mM (PubChem CID: 24895310), L-arginine monohydrochloride (PubChem CID: 87640969), L-asparagine (PubChem CID: 24890831), sodium pyruvate solution 100 mM (PubChem CID: 24899804), penicillin–streptomycin solution (PubChem CID: 86591708), doxorubicin hydrochloride (PubChem CID: 31703), dimethyl sulfoxide (DMSO) (PubChem CID: 679), trypsin–EDTA solution 0.25%, 3-(4, 5-dimethylthiazol-2-yl)-2, 5-diphenyltetrazolium bromide (MTT) (PubChem CID: 64965), phosphomolybdic acid (PubChem CID 24845315), and ceric sulfate (PubChem CID 159684) were purchased from Sigma-Aldrich (St. Louis, MO, USA). Fetal bovine serum was obtained from Gibco Life Technologies (Grand Island, NY, USA). Silica gel 60 (70–230) mesh and silica gel 200–400 mesh were purchased from Sigma-Aldrich (St. Louis, MO, USA). Preparative-thin layer chromatography (TLC) glass-backed 20 cm × 20 cm silica gel plates (2.0 mm thickness) and TLC aluminum-backed silica gel plates (0.2 mm thickness) were obtained from E.M. Merck (Germany). The heartwood of H. brasiletto was collected at Mochitlán, Guerrero, Mexico. 99°21'19.03” W; 17°29'03.27” N to 1042 msnm in March 2015. The specimens were taxonomically identified by Professor María de los Angeles Venalonzo Martínez, a voucher of classification was assigned (UAGROHBH15) and was deposited in the Herbarium of Universidad Autónoma de Guerrero. All plant materials were air-dried in the shade at room temperature. The dried samples were powdered and stored at 4°C. The plant extract was obtained based on the methodology described by González-Salvatierra et al. In brief, the ethanolic extract of the powder of heartwood of H. brasiletto (1 kg) was obtained by maceration with 96% ethanol (EtOH) at room temperature for 10 days with regular manual stirring twice daily. The combined EtOH extracts were evaporated under reduced pressure in a rotatory evaporator to yield the crude extract (50 g). The crude extract (HBM-1) was suspended in 250 mL of an aqueous (3:2 water [H2O]/methanol [MeOH]) mixture and the resulting suspension was fractioned by successive liquid–liquid partition with n- hexane (Hx), dichloromethane (CH2 Cl2), and ethyl acetate (EtOAc) to produce the corresponding low (HBM-2A [500 mg]), low-medium (HBM-2B [5 g]), and medium (HBM-2C [20 g]) polarity fractions, respectively. The ethanol crude extracts and their fractions were analyzed by TLC. A sample of 100 μg is dissolved in 100 μL of CH2 Cl2 and is applied to the plate using a capillary tube, and then placed in a chromatographic chamber and eluted with a suitable system. The plate is observed under ultraviolet (UV) light and the bands of interest were evaluated for their retention factor (Rf). Chromatographic analyses were performed on 5.5 cm 2, 0.2 mm thick silica gel plates (E.M. Merck DC Alufolien). All extracts were stored at −4°C in amber glass vials until use. Column chromatography (CC) was performed using silica gel 60 (70–230 mesh, Sigma). While silica gel 200–400 mesh (Sigma) was used for flash CC, vacuum liquid chromatography (VLC) purifications were carried out using TLC-grade silica gel (Merck). Gel-preparative TLC purifications were performed using glass-backed 20 cm × 20 cm silica gel plates (2.0 mm thickness, Merck). For analytical TLC analyses, aluminum-backed silica gel plates (E.M. Merck, 0.2 mm thickness) were used. Chromatograms were examined under UV light and then visualized by dipping the plates in a solution of phosphomolybdic acid (20 g) and ceric sulfate (2.5 g) in 500 mL of sulfuric acid (5%), followed by drying and heating to 100°C. VLC purification of the bioactive dichloromethane fraction (5 g), using a gradient elution with mixtures of CH2 Cl2:EtOAc: MeOH, produced 11 major fractions (3A-3K). Fraction 3B (1.45 g) was purified by CC eluting with n- hexane: EtOAc: MeOH (45:50:5) to produce 8 new fractions (4A-4H). Final purification of fraction 4C (152.5 mg) using a multiple elution (3×) preparative-TLC eluting with EtOAc: CHCl3:MeOH (70:30:10 + 50 μL of formic acid/10 mL of solution) resulted in the isolation of brazilin (1) (54 mg), which was identified by comparing its spectroscopic and spectrometric data with those in literature. The structure of isolated compound was determined by different spectroscopic analyses such as IR, NMR spectra (1H NMR,13 C DEPT 135 and DEPT 90), and two-dimensional experiments, such as hydrogen–hydrogen correlation (H–H COSY), heteronuclear multiple bond coherence (HMBC), heteronuclear single quantum coherence (HSQC), mass spectrometry, and also by comparison with literature data. For obtaining IR spectrum, we used a Bruker Tensor 27 spectrometer coupled with ATR.1H NMR and 13 C NMR were acquired on a Bruker Avance III, operating in 400 MHz for 1H NMR and 100 MHz for 13 C NMR. Samples were dissolved in CD3 OD. Chemical shifts were given in δ (ppm), and coupling constants (J) are expressed in Hertz (Hz). Residual not deuterated solvent peak (δH4.87, 3.31 and δC49.15) was set as reference, and tetramethylsilane (TMS) was used as an internal standard. DART-MS (Direct Analysis in Real Time Mass Spectrometry) was measured using a Joel AccuTOF JMS-T100 LC Mass Spectrometer (Japan) and positive ion [M + H +] was identified. Fourier-transform infrared (FT-IR) spectra were taken on a Bruker Tensor 27 spectrometer with photodiode detector using KBr pellets method for sample preparation. Cell lines such as ARPE-19 (human retinal pigmented epithelium), HeLa (human cervix carcinoma), SiHa (human cérvix squamous cell carcinoma), MDA-MB-231 (human mammary gland epithelial adenocarcinoma), NCI-H1299 (human lung carcinoma; nonsmall cancer cell), A549 (human alveolar adenocarcinoma), and LS 180 (human colorectal adenocarcinoma) were purchased from the American Type Culture Collection (ATCC, Rockville, MD). All cell cultures were maintained in DMEM supplemented with 5% heat-inactivated fetal calf serum (D5F) and grown at 37°C at an atmosphere of 5% CO2. To evaluate the effect of plant extracts on the proliferation of seven cell lines, cell proliferation was determined using the standard MTT assay. In brief, 10,000 cells (50 μL) were added into each well of a flat 96-well plate. After 12 h incubation at 37°C at an atmosphere of 5% CO2 to allow cell attachment, the cell cultures were incubated with 50 μL of medium containing different concentrations of either crude extract or fractions, and the cell cultures were incubated for 48 h. The crude extract or fraction was first dissolved in DMSO and then diluted in D5F. Control cell cultures were incubated with DMSO (final concentrations of DMSO: 0.06%–0.5%). The antitumor drug doxorubicin was used as a positive control due to its wide use in the clinic for the treatment of a broad spectrum of cancers. In the last 4 h of the cell culture, 10 μL of MTT stock solution (5 mg/mL) was added to each well. Formazan crystals were dissolved with acidic isopropanol, and the plates were read in an ELISA plate reader, using a test wavelength of 570 nm and a reference wavelength of 630 nm. The absorbance of the wells was read within 15 min of adding isopropanol. The antiproliferative activity of extracts was reported as IC50 values (IC50 was defined as the concentration of extract evaluated which inhibits cell proliferation by 50%). Values of proliferation of at least three experiments, in triplicate, were log transformed, normalized, and nonlinear regression analysis was used to generate a dose-response curve to calculate IC50 values. The differences in means were analyzed using one-way analysis of variance (one-way ANOVA) followed by Tukey's test GraphPad Prism 5 (GraphPad Software, Inc., CA, USA). In this study, the in vitro antiproliferative activity of the ethanol extract and isolated compound from H. brasiletto against seven cell lines was evaluated. Purification of the dichloromethane partition of ethanol extract of the heartwood of H. brasiletto led to the isolation of one known compound: brazilin, (C16H14O5) (6aS,11bR)-7,11b-Dihidro-6H-indeno [2,1-c] cromeno-3,6a, 9,10-tetrol [Figure 1]. 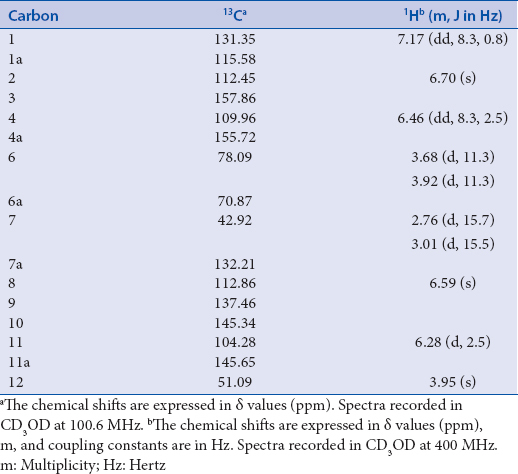 brazilin was characterized and identified by its spectroscopic data (1H NMR,13 C NMR, DEPT, COSY HSQC, HMBC, and IR) and by comparison with published values [Table 1], this compound was previously described. The flavonoid brazilin has been previously isolated from H. brasiletto, and Caesalpinia sappan. Recently, the antiproliferative activity of the extracts of H. brasiletto against A549, RAW 264, and L-929 cells was evaluated using the MTT assay, which demonstrates mitochondrial activity of cells and is commonly used to measure the cell viability. These previous results prompted us to perform the present study in which the aim was to isolate the compounds responsible for antiproliferative activity of the ethanol extract of H. brasiletto. The flavonoid isolated of chromatographic fraction of dichloromethane fraction of H. brasiletto was evaluated for its effects on proliferation of a panel of six human cancer cell lines (A549, LS180, H1299, HeLa, SiHa, and MDA-MB-231) and a normal (noncancer) human cell line (ARPE-19). The broad-spectrum chemotherapeutic agent, doxorubicin, was included as a positive control and for comparison purposes as it can induce apoptosis for intercalation into DNA and disruption of topoisomerase-II DNA repair. The results are presented in [Table 2]. The antiproliferative activity of brazilin was evaluated [Table 2], demonstrating that it causes a moderate inhibitory effect on the growth in the human SiHa, MDA, A549, and H1299 cell lines at IC50 values of 44.3, 48.7, 45.4, and 48.7 μM, respectively. In LS180 and HeLa, a low effect at IC50 62.2 and 71.9 μM, respectively, was observed. Brazilin showed a moderate antiproliferative effect on noncancer ARPE-19 cell line with IC50 value of 37.9 μM, suggesting that the antiproliferative activity of brazilin is nonselective. In this work, we demonstrated that brazilin, a flavonoid isolated and characterized of H. brasiletto, has antiproliferative activity against cancer cell lines. Rivero-Cruz  reported that brazilin inhibited the growth of S. aureus 375, S. aureus ATCC 25923, and E. faecium 379. Moreover, brazilin was described as an inhibitor of NO synthase, xanthine oxidase, protein kinase C, and aldose reductase enzymes. However, there are no reports of research of antiproliferative activity induced by brazilin on cell lines. Flavonoids with antiproliferative effect, such as kaempferitrin and curcumin, have previously been described. Several studies indicate that curcumin possesses reactive oxygen species (ROS)-inducing or pro-oxidant activity. It is known that ROS, including the superoxide anion, hydrogen peroxide, and hydroxyl radical, are known to mediate apoptosis induced by some cancer chemopreventive and therapeutic agents. Moreover, curcumin induces hypomethylation of the miR-203 promoter and subsequent upregulation of miR-203 expression. This leads to downregulation of miR-203 target genes Akt2 and Src that culminates in decreased proliferation and increased apoptosis of bladder cancer cells. Kaempferitrin may induce both transcription-independent and transcription-dependent pathways of p53 as it upregulates pro-apoptotic proteins and downregulates antiapoptotic proteins. Moreover, it has been described that an increase in p53 levels leads to cell cycle arrest at G1 phase. However, brazilin is more active than other compounds, such as a 5-fluorouracil, usually used in anti-tumoral clinical therapy which has IC50 values >100 μM in HeLa. Likewise, other natural products isolated from Sonora propolis in Mexico, such as CAPE, galangin, and xanthomicrol, exhibit an IC50 ≥60 μM in HeLa and A549 cell lines. In the same way, kaempferitrin, isolated from Justicia spicigera, shows IC50 >45 μM in HeLa. In this study, using a bioassay-guided method, we isolated one flavonoid with antiproliferative activity from H. brasiletto: brazilin (6aS,11bR)-7,11b-Dihidro-6H-indeno [2,1-c] cromeno-3,6a, 9,10-tetrol; this compound demonstrated antiproliferative activity against selected human cancer cells. Bergstrom R. Drivers of the cost of cancer care. Lancet Oncol 2012;13:14-5. World Health Organization, Prevalence Data of Cancer Worldwide. Available from: http://www.who.int/features/factfiles/cancer/en/index.htmlS. [Last accessed on 2016 Sep 06]. Kintzios SE, Barberaki MG. Plants that Fight Cancer. Boca Raton: CRC Press; 2004. Jiménez-Estrada M, Velázquez-Contreras C, Garibay-Escobar A, Sierras-Canchola D, Lapizco-Vázquez R, Ortiz-Sandoval C, et al. In vitro antioxidant and antiproliferative activities of plants of the ethnopharmacopeia from Northwest of Mexico. BMC Complement Altern Med 2013;13:12. Butler MS. The role of natural product chemistry in drug discovery. J Nat Prod 2004;67:2141-53. Gordaliza M. Natural products as leads to anticancer drugs. Clin Transl Oncol 2007;9:767-76. Kalekar S, Munshi R, Thatte U. Do plants mediate their antidiabetic effects through antioxidant and anti-apoptotic actions? An in vitro assay of 3 Indian medicinal plants. Complement Alternat Med 2013;13:257. Ren W, Qiao Z, Wang H, Zhu L, Zhang L. Flavonoids: Promising anticancer agents. Med Res Rev 2003;23:519-34. Argueta A. Atlas De Las Plantas De La Medicina Tradicional Mexicana. Vol. 1. México City, México: Instituto Nacional Indigenista; 2004. Heredia N, Escobar M, Rodríguez-Padilla C, García S. Extracts of Haematoxylum brasiletto inhibit growth, verotoxin production, and adhesion of enterohemorrhagic Escherichia coli O157:H7 to HeLa cells. J Food Prot 2005;68:1346-51. Rivero-Cruz JF. Antimicrobial compounds isolated from Haematoxylum brasiletto . J Ethnopharmacol 2008;119:99-103. González-Salvatierra C, Luis Andrade J, Escalante-Erosa F, García-Sosa K, Manuel Peña-Rodríguez L. Antioxidant content in two CAM bromeliad species as a response to seasonal light changes in a tropical dry deciduous forest. J Plant Physiol 2010;167:792-9. Zapata-Estrella HE, Sánchez-Pardenilla AD, García-Sosa K, Escalante-Erosa F, de Campos-Buzzi F, Meira-Quintão NL, et al. Bioactive metabolites from Cnidoscolus souzae and Acmella pilosa . Nat Prod Commun 2014;9:1319-21. Craig JC, Naik AR, Pratt R, Johnson E, Bhacca NS. Nuclear magnetic resonance spectra and stereochemistry of the antibacterial principle from Haematoxylum brasiletto . J Org Chem 1965;30:1573-6. Rascón-Valenzuela L, Jiménez-Estrada M, Velázquez-Contreras C, Garibay-Escobar A, Vilegas W, Campaner L, et al. Chemical composition and antiproliferative activity of Acalypha califórnica . Ind Crops Prod 2015;69:48-54. Rascón-Valenzuela L, Velázquez C, Garibay-Escobar A, Medina-Juárez LA, Vilegas W, Robles-Zepeda RE. Antiproliferative activity of cardenolide glycosides from Asclepias subulata . 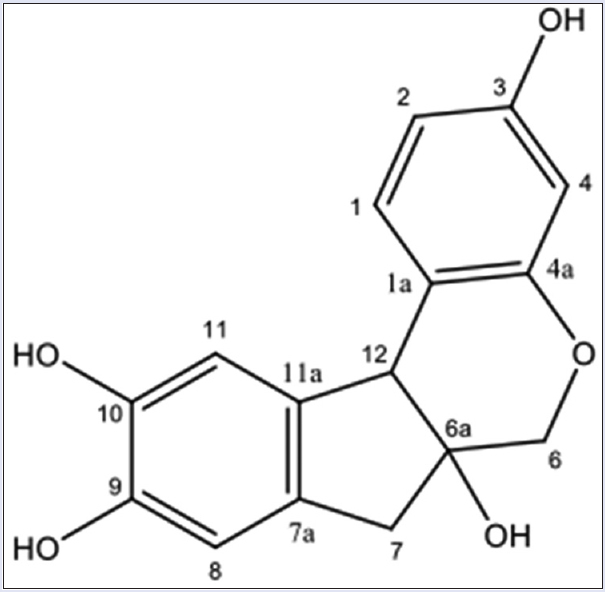 J Ethnopharmacol 2015;171:280-6. Torres-Moreno H, Velázquez CA, Garibay-Escobar A, Massimo C, Marcotullio MC, Robles-Zepeda RE. Antiproliferative and apoptosis induction of cucurbitacin-type triterpenes from Ibervillea sonorae. Ind Crops Prod 2015;77:895-900. Sanchez-Marroquin A, Garcia L, Mendez M. Brazilin, antibacterial substance from Haematoxylum brasiletto . Rev Latinoam Microbiol 1958;1:225-32. Pratt R, Yuzuriha Y. Antibacterial activity of the heartwood of Haematoxylum brasiletto . J Am Pharm Assoc 1959;48:69-72. Nguyen MT, Awale S, Tezuka Y, Tran QL, Kadota S. Xanthine oxidase inhibitors from the heartwood of Vietnamese Caesalpinia sappan . Chem Pharm Bull (Tokyo) 2005;53:984-8. Sasaki Y, Hosokawa T, Nagai M, Nagumo S.In vitro study for inhibition of NO production about constituents of Sappan lignum . Biol Pharm Bull 2007;30:193-6. Kim GG, Kim YM, Khil LY, Jeon SD, So DS, Moon CH, et al . Brazilin inhibits activities of protein kinase C and insulin receptor serine kinase in rat liver. Arch Pharm Res 1998;21:140-6. Moon CK, Yun YP, Lee JH, Wagner H, Shin YS. Inhibition of lens-aldose reductase activity by brazilin and haematoxylin. Planta Med 1985;51:66-7. Thorn CF, Oshiro C, Marsh S, Hernandez-Boussard T, McLeod H, Klein TE, et al. Doxorubicin pathways: Pharmacodynamics and adverse effects. Pharmacogenet Genomics 2011;21:440-6. Alonso-Castro AJ, Ortiz-Sánchez E, García-Regalado A, Ruiz G, Núñez-Martínez JM, González-Sánchez I, et al. Kaempferitrin induces apoptosis via intrinsic pathway in HeLa cells and exerts antitumor effects. J Ethnopharmacol 2013;145:476-89. Javvadi P, Segan AT, Tuttle SW, Koumenis C. The chemopreventive agent curcumin is a potent radiosensitizer of human cervical tumor cells via increased reactive oxygen species production and overactivation of the mitogen-activated protein kinase pathway. Mol Pharmacol 2008;73:1491-501. Davis W Jr., Ronai Z, Tew KD. Cellular thiols and reactive oxygen species in drug-induced apoptosis. J Pharmacol Exp Ther 2001;296:1-6. Saini S, Arora S, Majid S, Shahryari V, Chen Y, Deng G, et al. Curcumin modulates microRNA-203-mediated regulation of the Src-Akt axis in bladder cancer. Cancer Prev Res (Phila) 2011;4:1698-709. Haupt S, Berger M, Goldberg Z, Haupt Y. Apoptosis – The p53 network. J Cell Sci 2003;116:4077-85. Alonso-Castro AJ, Ortiz-Sánchez E, Domínguez F, Arana-Argáez V, Juárez-Vázquez Mdel C, Chávez M, et al. Antitumor and immunomodulatory effects of Justicia spicigera Schltdl (Acanthaceae). J Ethnopharmacol 2012;141:888-94.